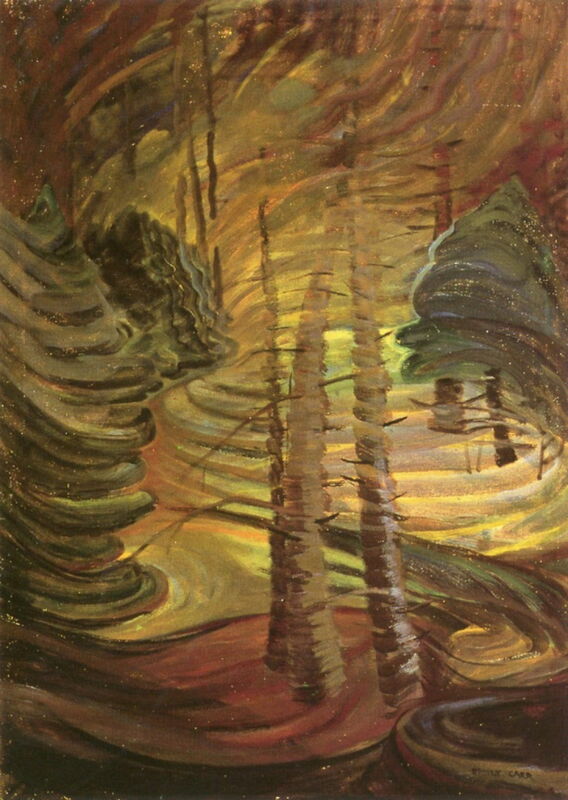 Emily Carr (1871–1945), Dancing Sunlight (1937-40), oil on canvas, 83.5 x 60.9 cm, McMichael Canadian Art Collection, Kleinburg, ON. The Athenaeum. At the beginning of 1937, Emily Carr was sixty-five, and just about to confirm her international recognition with representation in group exhibitions in London’s Tate Gallery (1938), and at the New York World’s Fair of 1939. Painting from her caravan, The Elephant, she was continuing to innovate in the landscape around Victoria, British Columbia. 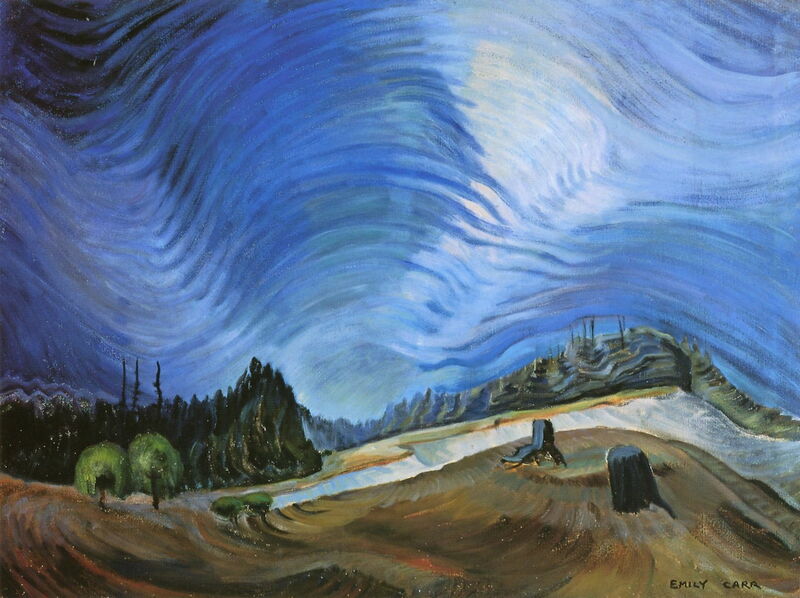 Emily Carr (1871–1945), Above the Gravel Pit (1937), oil on canvas, 76.8 x 102.2 cm, Vancouver Art Gallery, Vancouver, BC. The Athenaeum. Carr described Above the Gravel Pit (1937) as “a skyscape with roots and gravel pits”, which she wanted to be “free and jubilant, not crucified into one spot, static.” Her paintings in the final years of her career show the ultimate development of her brushstrokes into the unifying framework for these paintings. The vibrant blue waves of the sky contrast with the greens and browns of the earth below. But Carr links the sky and trees with both hints of colour and echoing patterns made by her brush: these extend into the shallow chalk scarp and the two treestumps in the right foreground. Then Carr had her first heart attack; The Elephant was too much effort for her, and she had to rent summer houses and cabins to continue her landscape painting. She turned more to writing, and in 1941 won a literary award for her first book, Klee Wyck, a collection of short stories about her travels in the Pacific North-West. In her Dancing Sunlight (1937-40), vortexes of brushstrokes have replaced all solid form. Trees, light, foliage, even the sky have been swept into those strokes, which sweep across the canvas like a whirlwind. Carr had earlier been absorbed by abstract art, but had continued to represent real objects using techniques which restructured them, rather than abstracting. 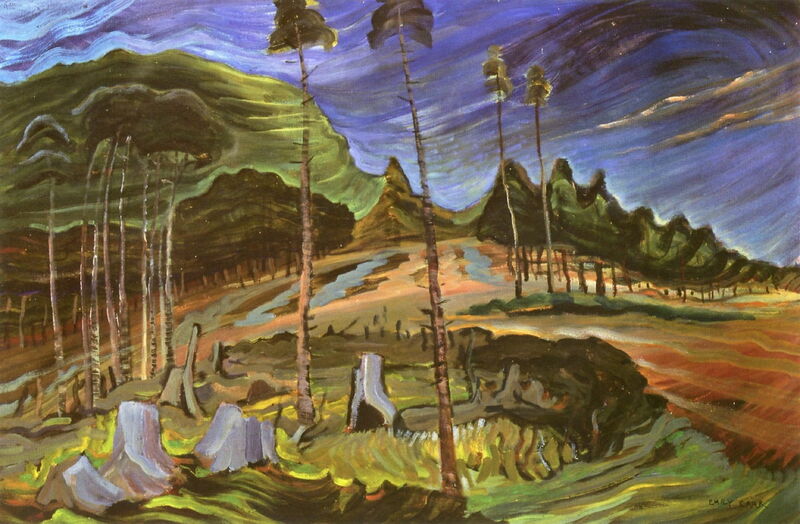 Emily Carr (1871–1945), Somberness Sunlit (1937-40), oil on canvas, 111.9 x 68.6 cm, Provincial Archives of British Columbia, Victoria, BC. The Athenaeum. Somberness Sunlit (1937-40) shows a similar approach, in this case with the sunlight which has penetrated through the canopy dissolving the form of the tree trunks. 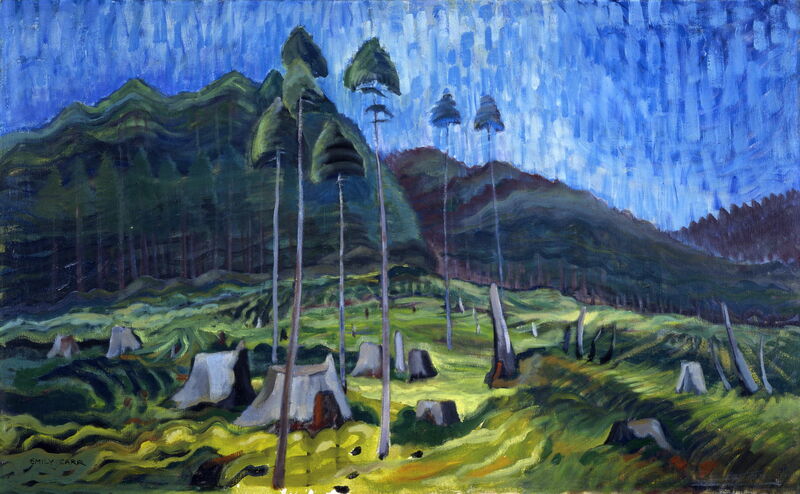 Emily Carr (1871–1945), Untitled (1938-39), oil on paper, 90.8 x 60.8 cm, Vancouver Art Gallery, Vancouver, BC. Wikimedia Commons. Over this period, Carr had a growing concern over the deforestation which was occurring on the West Coast, and paralleled the earlier encroachments and destruction by Europeans of the First Nations cultures. Themes which she had previously expressed in paintings such as Scorned as Timber, Beloved of the Sky (1931) were now rephrased using patterned and unifying brushstrokes, in paintings such as this untitled work from 1938-39. Emily Carr (1871–1945), Odds and Ends (1939), oil on canvas, 67.4 x 109.5 cm, Art Gallery of Greater Victoria, Victoria, BC. Wikimedia Commons. Odds and Ends (1939) is another of her most important paintings, not just from this period, but from her whole career. It shows the young and very high trees which were left behind as being of no commercial value after felling. Carr described the low stubs left on the stumps as being the trees’ tombstones. In 1939, she suffered her second heart attack, which further curtailed physical activity. 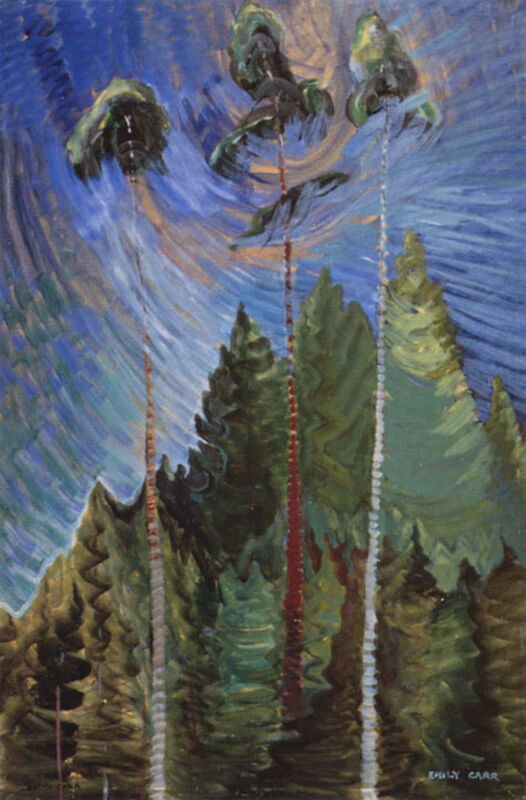 Emily Carr (1871–1945), Plumed Firs (1939-41), oil on canvas, 65.4 x 99.2 cm, University of British Columbia, Vancouver, BC. The Athenaeum. In Plumed Firs (1939-41), Carr revisits a very similar motif, following felling, with greater unification of her brushstrokes and marks between sky, forest, and the bare land left after felling. Carr suffered her first stroke in 1940, and a second in 1944. She continued to paint in her final years, but the pace was drastically reduced, and she concentrated her efforts on her writing. 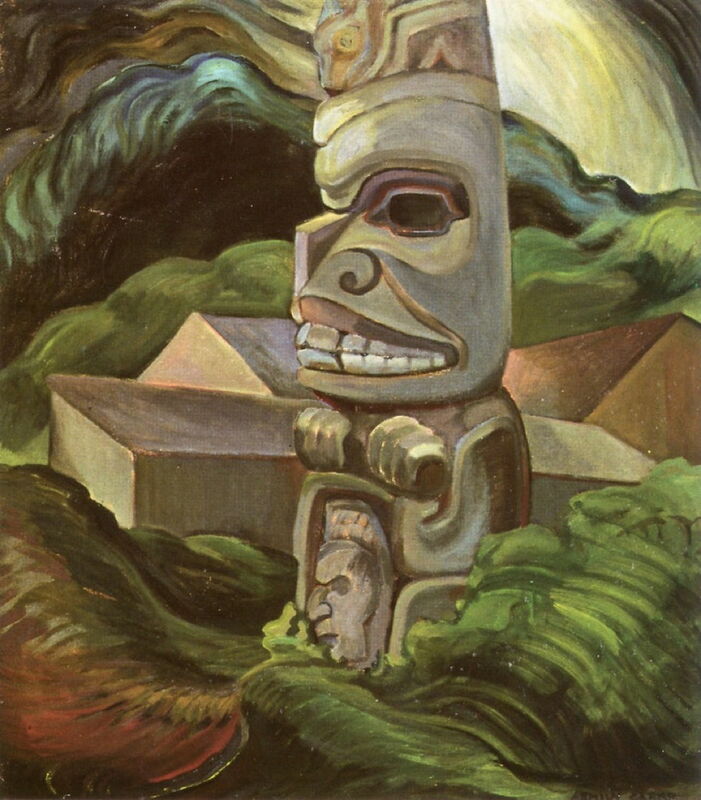 Emily Carr (1871–1945), A Skidegate Beaver Pole (1941-42), oil on canvas, 86.2 x 76 cm, Vancouver Art Gallery, Vancouver, BC. The Athenaeum. In 1941-42, Carr painted a small series of works based on her earlier sketches and paintings among the First Nations peoples in around 1912. A Skidegate Beaver Pole (1941-42) is one of those, which she developed from a group of sketches made in the Haida village of Skidegate in 1912. The totem is painted more confidently than in her work of around 1912; those earlier sketches and paintings now looked quite tentative in their careful accuracy. Now the surrounding vegetation, forest, and the sky are all expressed in swirling brushstrokes. 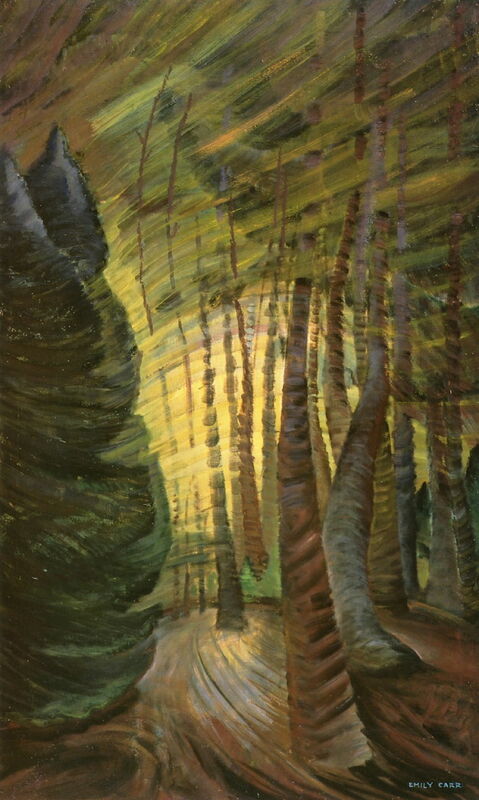 In August 1942, she travelled to Mount Douglas Park, near Victoria, for her last painting trip. She had been organising works to be given in trust for the citizens of British Columbia, which now form the core of the Emily Carr Trust collection. She died in 1945.